The Venom Blackbook 15x is big and packed with features that should please demanding users. It has a sharp configuration in its base, which includes a Core i7 CPU, GeForce GTX 680M GPU and 32GB of RAM, and its Full HD screen is simply stunning. Well worth considering if you're after a powerhouse desktop replacement notebook. The Venom Blackbook is a powerhouse notebook computer that's designed to appeal not only to gamers, but also to design, engineering and video professionals who want something fast, yet classy. 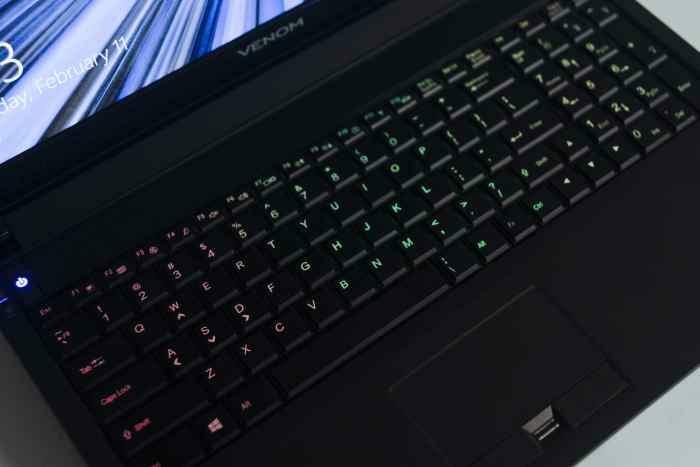 Venom has shunned plastic mouldings and illuminated logos for its design, instead incorporating straight, clean lines, a dark matte finish and only a small amount of gloss to make a laptop that looks appealing. Of course, it has a high price tag, but this should be of little concern if you really need the power that lies within. In saying that, the Venom Blackbook, which features an Intel Core i7-3630QM CPU, 32GB of RAM, an NVIDIA GeForce GTX 680M graphics adapter, two solid state drives and a stunning Full HD display, is priced competitively. In comparison to a similarly configured machine from Origin that also uses the same chassis, it's about $200 cheaper. You get a glut of ports around the edges and excellent input devices, too. It's a notebook computer that can easily replace a desktop due to its strong configuration and, importantly, it's a notebook that is not all that difficult to carry from home to the office. It weighs 3.2kg but it feels well balanced and actually a little light for what it is. MLN, which is the Melbourne-based store that sells this computer, can also supply an extra 180W power brick for $129, which means you can leave one at each location rather than have to carry it with you every day. Even though it's a large notebook, if you're big enough and strong enough, you'll have no problems using it on your lap. It gets warm, but only when the graphics (GPU) or CPU are seeing lots of processing action. 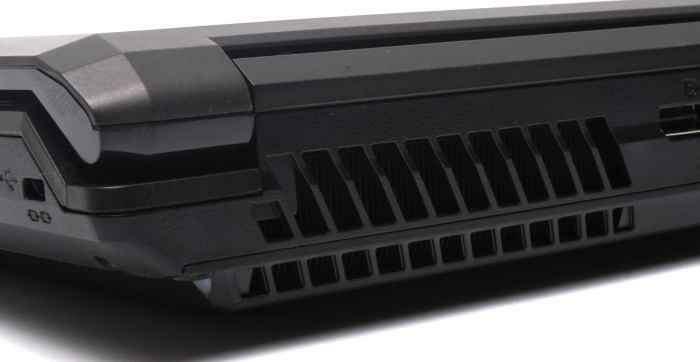 There is a dual-exhaust system on the rear that does a great job of keeping the unit cool for the most part — one fan is for the GPU, the other for the CPU, and heat pipes are used to connect to the heftier heat sinks that sit in front of the fans. The fans get a little loud when the machine is working on a tough job or running a game, but we didn't find them too annoying — those around us probably did. It's an exhaust system that's similar to what we've seen on ASUS RoG units in the past, although not quite as mean-looking. One of the rear vents. The build quality of the notebook feels solid and the texture of the palm rest and lid is smooth yet slightly rubbery in its feel. We like the layout of the power button and speakers across the top of the keyboard, as well as the fact that there aren't any unnecessary shortcut keys. Perhaps the only part of the notebook's design that looks a little out of place is the glossy bezel around the screen. The screen itself is matte, which means there are no problems with it reflecting light, but reflections off the bezel can sometimes be distracting. Its 15.6in panel is one of the best we've seen on a notebook. The colours are rich and accurate, the horizontal viewing angles are almost 180 degrees side to side and the brightness is high. There's only a slight let-down on the vertical viewing angle, but we didn't find it to be problematic during testing. It's a screen that claims to have a 95 per cent colour gamut, and we found it to be perfect for viewing photos and videos. The screen excels at displaying video and high-resolution images, so it's a good model to consider if you're a photographer or regularly shoot and edit video. Dark details in photos, such as shadows, were shown perfectly, while black parts in movies did not look washed out. Games also looked magnificent on the screen (even dark ones such as F.E.A.R 2) and motion was handled well. The native resolution is 1920x1080, so you'll want to play all your games at that resolution. The GeForce GTX 680M graphics card inside this notebook is a current high-end model that can handle new games with ease, even at the native resolution of the screen, and at high or ultimate detail levels (depending on the age of the game). We had no trouble running Battlefield 3 at 1920x1080 and with High image detail enabled. In this mode it returned frame rates between 50 and 60 frames per second (fps). When we upped the image detail to Ultra, the frame rate dropped to between 30 and 40fps, depending on how hectic the action was on the screen. We observed good scores in the 3DMark tests we ran, too: 3DMark06 ended up with 17125, 3DMark11 with P5914 and the latest 3DMark Cloud Gate and Fire Strike tests notched up 15411 and 1500, respectively. Along with the high-end graphics adapter, the Venom has top-notch processing thanks to its Intel Core i7-3630QM CPU, which has four cores and Hyper-Threading, and which runs at a standard speed of 2.4GHz. It recorded expected times of 19sec and 43sec in our Blender 3D rendering and iTunes MP3 encoding tests, respectively, and it also put up short times in our video transcoding tests. It took only 34min to convert our DVD file to an Xvid file using AutoGordianKnot, and only 9min 54sec to convert that same DVD file to an MP4 file using Handbrake. You'll have no problems at all using this notebook for archiving your DVD collection, and it will also be useful for video editing, too. With 32GB of RAM installed in the notebook's four SO-DIMM slots (8GB each), there is no immediate concern of ever running out of memory when multitasking or working with big files in photo editing suites, for example. Furthermore, with quick storage devices, you'll rarely notice sluggishness when loading applications or switching between them — we certainly didn't — and copying data over from USB drives was done at the maximum rate supported by the external device and its interface. You won't find a lot of software cluttering the installed drives either, with only essential codecs and a fully working anti-virus suite installed (Norton Internet Security for 12 months) and recovery files are supplied on USB storage rather than stored on the system. The formatted storage capacity of the Venom is 684GB in total, and that is made up of two solid state drives: a 256GB Crucial M4 mSATA drive, and a 480GB Intel 520 Series drive. The Crucial drive is the operating system drive, while the Intel is the secondary drive. These drives performed reasonably well in our tests: in CrystalDiskMark, the Crucial got a read rate of 270 megabytes per second (MBps) and a write rate of 213MBps, while the Intel drive got a massive 507MBps read rate and a write rate of 300MBps. A killer configuration for this notebook would be three storage drives (with one installed in the optical bay), with two of those in a RAID 0 array (which the BIOS supports). The right side, which includes the Blu-ray writer, audio ports, a USB 2.0 port and a cable lock facility. A Blu-ray writer is installed in the right side of the chassis, which facilitates not only movie watching (CyberLink decoding software is pre-installed), but also archiving to optical media. We used it to rip some DVDs and it did so very quickly and without making any unnecessary noises. Battery life on such a big notebook with high brightness is never really a deal breaker, but the battery in the Blackbook put up a decent fight against our rundown test. In this test, we disable power management, enable Wi-Fi, maximise screen brightness and loop an Xvid-encoded video until the notebook conks out. The Venom lasted 2hr 45min, which is enough to let you get through most movies. The CPU's integrated Intel HD 4000 graphics are used when the battery is powering the notebook. All up, a good result. Connectivity is abundant on the Venom Blackbook: you get four USB ports in total (three of which are USB 3.0 and one which also doubles as an eSATA port), Gigabit Ethernet, mini FireWire, DVI, HDMI, DisplayPort, headphone output, optical audio output, microphone and line in, as well as a full-sized SD card slot. Lots of external storage can be plugged in via the USB and eSATA ports, while high-resolution monitors can be attached to the DVI and DisplayPort connections. There's not much missing from this unit at all — you also get a webcam, Bluetooth and Intel Centrino Advanced-N 6235 dual-band wireless networking, which transferred large files at a good rate of 12MBps in our network environment. On the left side you get FireWire, Gigabit Ethernet, USB 3.0, eSATA and an SD card slot. Meanwhile, the rear has a DisplayPort, HDMI, DVI and the power port. The input devices on the Blackbook are second to none. The keyboard has keys that are soft, with plenty of travel and responsive feedback and it's a pleasure to type on. Not only that, the keyboard has an adjustable backlight that can illuminate the keys in three different colours at the same time and in various patterns. It's one of those features that just makes you want to have this product. The only fault in the keyboard for us is the location of the Fn key, which is on the right side of the space bar rather than on the left side. This, along with an extra backslash key, means that the space bar is a little more to the left than usual and it took some getting used to. The other excellent input device on this notebook is the Synaptics touchpad, which has a soft, rubber-like texture that feels very comfortable to glide over. More than that though, it was impeccably accurate during our tests. Taps were registered perfectly and multi-finger gestures such as three-finger swiping and two-finger scrolling were recognised all the time. Windows 8 swipe-in gestures were also recognised without incident, and we never accidentally invoked these despite the pad being a little small (88x46mm) which again is a testament to how precise this pad was during our tests. Its physical left- and right-click keys were also a pleasure to use. The keyboard has a comprehensive backlight system that allows three sections to be coloured differently. It can be controlled through software and you can select from various flashing patterns, colours and intensity. Nestled in between the touchpad keys is a fingerprint reader, which we were able to use to log in to Windows and also to log in to Web sites once we stored our credentials with it. Using the preinstalled AuthenTec TrueSuite software, you can easily enter your information for sites such as Gmail, Facebook, Twitter, Flickr, and many others, and it worked for us in Firefox, Chrome and IE. It's easy to add other sites to the list, too. Physically though, the reader sits a little too deep between the buttons and can feel uncomfortable. Audio is handled by speakers are driven by the THX Studio Sound application, which, if disabled, leaves the sound flat and lifeless. With the THX equaliser enabled, the sound is well rounded, but not very rich — the speakers are small, after all. There is a lack of depth to the sound when listening to music, but they are still enjoyable to listen to — vocals especially sounded clear and concise in our tests. When playing movies, you can adjust the virtual surround sound qualities of the output as well as make the dialogue a focus. Best of all though, you can pump the audio through the digital output to an amplifier, so you do have options if you want larger sound. 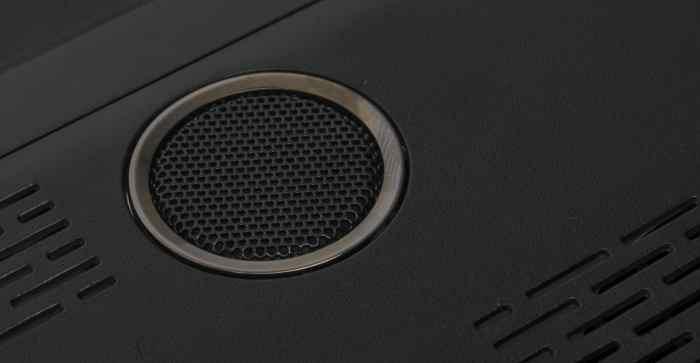 There is a 2.1 speaker system, which includes a sub-woofer at the bottom of the notebook. When paying thousands for a notebook, support plans are important, and the Venom Blackbook has what is basically a par-for-the-field one-year warranty. There are options for a longer support period though. Furthermore, while talking with the product director from MLN, we were told that the one-year warranty is a 'Face 2 Face' warranty, which means that the person who sells you the notebook is the one that you can go to directly should anything go wrong with it. This means that the person who sold it will have the experience to deal with any problems, and theoretically you won't have to chase various people to find out what's going on with your computer. You also get a 'hand-over' when you purchase the laptop in the store (similar to if you were buying a car) so that you know exactly what you're getting. It's hard not to lust over the 15.6in Venom Blackbook when you see it; its screen is beautiful and its overall design is elegant. It has one of the fastest configurations in the country for a notebook and is primed for use by gamers and professionals who need lots of CPU power under the hood. It's a desktop replacement in the true sense of the word and there's not much that we would add to it apart from some more storage space, which can easily be done with external options anyway. All up, a great notebook at a competitive price that's well worth considering if you're after some serious grunt under the hood, and a screen that can make photos and videos looks breathtaking. If you want something cheaper, there are other models in the Venom range that feature the same screen and CPU in the same chassis, but with different storage, RAM and graphics options. A 17.3in version is also available. If you need help using the new Windows 8 interface on a notebook such as this one, be sure to check out our Beginner's Guide to Windows 8. We show you how to use the Start screen and all of the other features that the new operating system offers.